ALTHOUGH the Light 'Plane movement in Germany has followed somewhat different lines from ours, mainly due to the fact that, whereas we very quickly departed from our earlier conception of the light 'plane, Germany has, ДальшеMore>>> until comparatively recently, adhered to the original ideal: a two-seater aircraft with very low engine power, there are clear indications that the outstanding success achieved by the British version of the light 'plane all over the world is causing German opinion to change, and more than one German constructor has turned his attention to the type of machine to which we in this country have become accustomed. 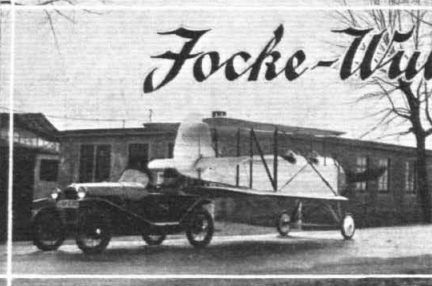 One of the latest German firms to produce a light 'plane after the British pattern is the Focke-Wulf Flugzeugbau, of Bremen. The new machine, known as the type S.24 "Kiebitz," bears unmistakable evidence of British influence in its whole general conception, although the detail work remains, naturally enough, typically German. The machine was designed to have a tare weight of less than 400 kg. so as to bring it into the heaviest of the light 'plane classes, so that it affords a very interesting comparison with the general run of British light 'planes. That Germany is determined to enter the world market for this general class of machine is evident from a statement made by the Focke-Wulf firm to the effect that, before the prototype machine had completed its tests before the D.V.L., the Bremer Verein fur Luftfahrt had ordered one, while 20 more were ordered from abroad, one of the conditions being that nine of these machines were to be delivered within a period of two months, between December 15, 1928, and February 15, 1929. In spite of delays of various sorts, caused by the intense cold weather during that period, the machines, it is claimed, were delivered on time. 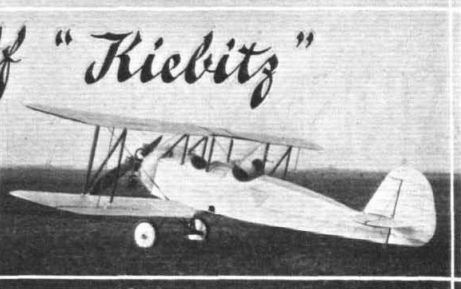 The "Kiebitz" (Peewit) is a normal single-bay braced biplane as regards its general arrangement, and what is somewhat unusual for a German light 'plane, its wings are designed to fold. An unusual feature of the design is that the wing bracing is in the front bay only, where the lift wires are in duplicate; the landing wires are single. This arrangement has been made possible by the adoption of a bi-convex wing section, very nearly symmetrical, the centre of pressure of which is all but stationary. Thus the front spar is a very substantial member placed on the centre of pressure, while the rear spar is quite light, and serves mainly to provide the drag bracing via plywood covering on the lower surface. "N"-struts between the wings provide the "incidence bracing,"
It is likely that this type of wing bracing is quite satisfactory as far as concerns flying loads, &c. But obviously the designers came up against difficulties with the wing folding. 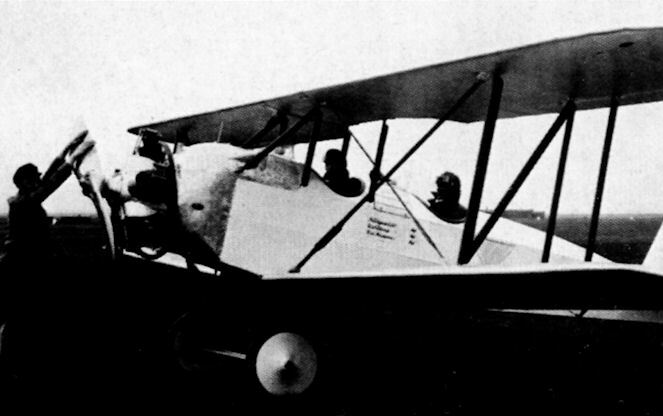 In the original photographs can be seen quite clearly (although less so in the reproductions) not only the “jury strut" used in the front bay when the wings are folded, but also what might be termed a "jury wire," i.e., a wire running from the rear spar, top centre section joint, to the lower front spar joint at the foot of the "jury strut." With no bracing in the plane of the rear spar, this wire evidently was required to prevent the wings from sagging and straining the hinges when the wings were folded. What rather indicates that this part of the wing-folding arrangement is not as neat as it might be is a statement to the effect that “during the East Prussia Competition the crew (of 2) took only 9 mins. to wheel the machine out of the hangar, through a door 2-5 m. (8 ft. 3 in.) wide, spread the wings and start the engine." Assuming that the engine started at once, this would seem to be quite a long time for spreading the wings, and the majority of British light 'planes could be put through the same operation in something like half the time. The arrangement of fuselage, seating accommodation, engine and undercarriage is exactly as in British practice. The fuselage of the Focke-Wulf "Kiebitz" is of welded steel tube construction, the front portion being a rigid structure with diagonal struts welded in, while from the pilot's cockpit back to the tail the bracing is in the form of wires. As in all Focke-Wulf machines, the welded joints are reinforced either by sleeves or by flat plates. The covering is fabric with the exception of the extreme forward part, in the neighbourhood of the engine, where aluminium is employed. The two cockpits are arranged in tandem, and each has its set of controls, its instrument board and its engine controls. There is a small windscreen in front of each cockpit The pilot's cockpit is normally the rear one, the forward cockpit being placed approximately over the e.g. so that the machine may be flown solo without any appreciable change in trim. The engine normally fitted is a Siemens Sh. 13 of 60/70 h.p. but it is understood that any engine, within reason, of approximately 50 h.p. and weighing not more than about 130 kg. (286 lb.) may be fitted to suit customers' requirements. The engine is mounted on a fireproof bulkhead, the engine controls being passed through special fire traps. The petrol tank, of brass sheet and with internal baffles, is placed in the deck fairing, behind the fireproof bulkhead. It has a capacity of 50 kg. (110 lb., or approximately 15 1/2 gallons). In spite of the location of the petrol tank in the fuselage, direct gravity feed is provided, so that the petrol system is as simple as on British light 'planes, but the proximity of the tank to the engine might be criticised in this country, in spite of the presence of a fireproof bulkhead. An undercarriage of very simple type is fitted, consisting of two vees of steel tubing, with a cross-axle carrying a pair of wheels. As far as can be seen in the photographs, the shock-absorbing medium is plain rubber cord, which is now hardly ever seen on a modern British light 'plane. The track of the undercarriage is fairly wide, (1-5 m. = 4 ft. 11 in. ), and the whole undercarriage can be taken off by undoing the four bolts at the top of the vees, and the diagonal bracing cables. 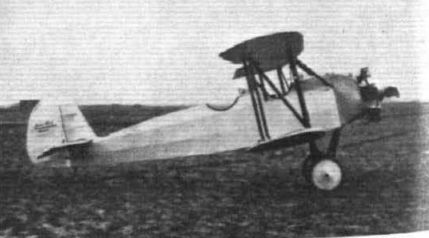 As already mentioned, the wings are arranged in the form of a single-bay biplane, with lift and anti-lift bracing in the plane of the front struts only. There is no internal drag bracing, the function of this being performed by a plywood planking on the under surface extending from the front spar to the rear spar. Ailerons are fitted to both top and bottom planes. The hinges are set back from the spar on short brackets, and the interconnecting struts run, not as is more usually done in this country from points on top and bottom ailerons behind the hinge, but from cranks extending forward into slots cut in the main wings. The ailerons, like all the other control surfaces, are plywood-planked box constructions. The vertical fin is of welded steel tube construction and is built integral with the fuselage. The tail plane is of all-wood construction with plywood planking, and owing to the small travel of the centre of pressure of the main wings, the tail plane has been kept quite small, smaller, in fact, than the elevators, which are also plywood boxes. The rudder has a small horn balance projecting over the top of the fixed fin. The tare weight of the "Kiebitz" is (with Siemens Sh 13 engine) 365 kg. (800 lb. ), and the disposable load 220 kg. (485 lb. ), giving a total loaded weight of 585 kg. (1,285 lb.). This gross weight gives a wing loading of 30 kg./sq.m. (6-12 lb./sq. ft.) and a power loading (based on 65 h.p.) of 9 kg. (19-8 lb.) per h.p. The maximum speed is 150 km./h. (93 m.p.h.) and the landing speed 70 km. (43-5 miles) per hour. The climb to 1,000 m. (3,300 ft.) takes 8 mins., and the ceiling is 3,500 m. (11,500 ft.). Finally it might be stated that the "Kiebitz" comes under group 5 of the Deutsche Versuchsanstalt fur Luftfahrt, which is roughly equivalent to the "aerobatics" certificate in this country. Thus the machine may be used for stunting at the gross weight stated, i.e., 1,285 lb. The machine is reported to be very easy to fly and to have good controlability. It is claimed that it does not readily go into a spin, at least not accidentally, but that it can be spun quite well if the pilot sets out to do so deliberately; it then comes out of the spin quite quickly and easily. In view of the fact that a certain British machine with, as far as one can see, a very' similar wing section, and curiously enough with almost identical wing bracing (not that this probably has anything to do with the matter) was found to spin very suddenly and violently when deliberately stalled, the results claimed for the "Kiebitz" are interesting. Крылья S 24 были сделаны складывающимися, чтобы обеспечить возможность его перевозки на буксире за автомобилем. В 1929 году S 24 Kiebitz установил мировой рекорд дальности полета в своем классе, преодолев 1601 км. Позднее, в 1931 году, он даже выиграл чемпионат по высшему пилотажу Германии. THE FOCKE-WULF "KIEBITZ" has folding wings, and makes use of "Jury Wires" as well as of Jury Struts. 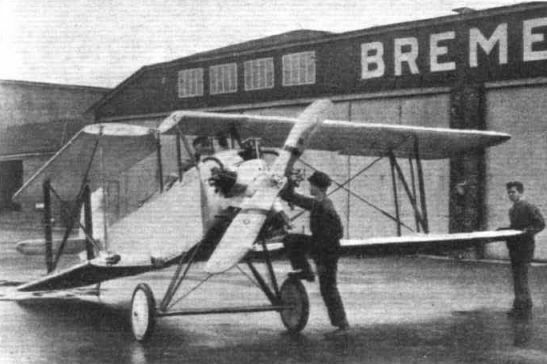 A GERMAN LIGHT 'PLANE SHOWING SIGNS OF BRITISH INFLUENCE: In the design of the "Kiebitz" many points of similarity to current British practice are found. Note for instance the folding wing biplane arrangement. The machine may be towed behind a car. A TOPSY-TURVY WORLD: Herr Achgelis has gained fame in Germany by his extraordinary upside-down flying very close to the ground. He approaches the aerodrome in an inverted dive, and when a few feet from the ground does a bunt into the upright position, from which he half-loops again into the inverted position. The machine is a Focke-Wulf "Kiebitz," with wings of bi-convex section, specially strengthened for these evolutions. Herr Achgelis (left) is seen in the larger photograph flying upside-down at Heston. On this occasion he was flying quite high.